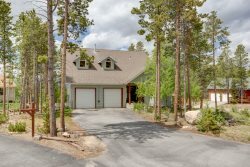 Log Cabin Charm, Peaceful & Private Location, and Mountain Views! You'll love the care and custom details the Angell family put into this cabin, like high ceilings and windows, the log breakfast bar, and cozy furniture. This luxurious getaway sleeps up to six guests between a king bedroom with ensuite bath downstairs, and two queen bedrooms upstairs. The upper level also has a full bathroom and a cozy den that overlooks the main floor. Wake up to stunning mountain views, then sip your coffee on the porch swing! You can cook meals in the kitchen or out on the grill. Right out your door there's abundant hiking, boating, fishing, biking, four wheeling, and autumn leaf-peeping, plus the quaint nearby Village of Twin Lakes. When Independence Pass is open, you can take a beautiful, meandering drive to Aspen, plus Leadville and Buena Vista are close by for year-round shopping, dining, and more. For entertainment at home, there's a TV with cable & DVD player, plus a Nintendo 64. If you like your vacations to be centered around relaxing, there's no better setting than the quiet of the woods! Great house with awesomely stocked kitchen! We especially liked the "egg beater" and "Potato Peeler" on the shelf above the sink, too cute! Here for the LT 100 Run, 2 of 4 finished! All had a spectacular time staying up here in Twin Lakes. If you're in a large group desiring or requiring more space to spread out, why not consider renting two homes close to each other? The Quaking Aspen is your closest neighbor, just 1.2 miles down the road from Angell's Retreat. We're happy to help you over the phone as well!